We've been organizing these Cobaya dinners for almost two years now and they continue to be a lot of fun to plan and even more fun to attend. If you have not participated in an "experiment" yet or are unfamiliar with the concept, we sell these blind and they sell out quickly, we do not reveal the chef, restaurant or menu prior to the dinner and the location is only provided the day before. Some are "off campus" which keeps the diners in further suspense. All of this is done in order to maintain the "underground" nature of the events and to add an element of surprise. Obviously, my co-conspirators and I miss out on that aspect. That being said, Frodnesor and I both entered this one on the "blind side" and took a leap of faith this go round. 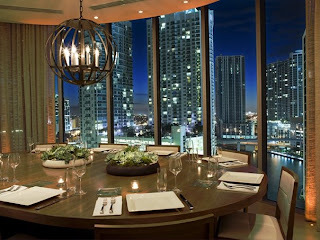 The latest dinner took place on June 13, 2011 at Area 31, located on the 16th floor of the Epic Hotel in downtown Miami. Chef E. Michael Reidt recently returned to Miami to run the kitchen at Area 31 after successful stints on the west and east coast. When I heard that Chef Reidt was returning to the area, I was excited because I knew he was not only very talented but had Cobaya-esque skills. That leap of faith I alluded to earlier was because neither of us had been to Area 31 following his return. It's embarrassing to admit and I attribute it primarily to the location of the restaurant since I don't live or work downtown. Regardless, DON'T make the same mistake I we made. Although I didn't sample his Area 31 fare prior to the dinner, I was very familiar with his talent. I enjoyed several meals at Wish (South Beach) during his tenure there in the early 2000's. I was also well aware that he was named one of the country's best new chefs by Food and Wine magazine in 2001 plus won the prestigious Rising Star award by Star Chef in 2003. What also intrigued me was that he left Miami to open his own successful restaurant in Santa Barbara which specialized in Latin fusion. John Mariani via Esquire magazine called Sevilla one of the best new restaurants of 2005. After taking a couple years off to travel the world he returned to his east coast roots and the kitchen at B&O Brasserie in Baltimore. His food at B & O impressively appeared to be a complete departure from what he did at both Wish and Sevilla. Additional accolades soon followed as he was named Best New Chef by the Baltimore Sun in 2009 and Best New Restaurant by Baltimore Magazine that same year. With a resume like this was it really a leap of faith?? Chef Reidt immediately got our senses going by encouraging us to put our nose(s) into the bowl where the amuse-bouche rested. The locally sourced flowering basil had a strong, pleasant aroma that kick started my taste buds. The heirloom tomatoes, peaches, truffle cheese and tomato water was a light and very refreshing start to the dinner. This was paired perfectly with a glass of champagne. The first course really set the tone for the rest of the evening from a flavor, texture and color standpoint. Chef Reidt served us his version of a ceviche which featured small pieces of really fresh cobia. Chef Reidt showcased his ability to combine several ingredients with great flavors and textures that worked in unison to form a standout dish. Alongside the cobia were apple, jicama, and sweet potato, which was plated on top of pressed avocado and accompanied by a red pepper sorbet and puffed rice. This was dish of the night caliber except for the fact that there were two other dishes that were even better. The second course was easily my favorite dish of the night. I'm a huge foie fan and I really enjoy experiencing different preparations. Chef Reidt aggressively and successfully prepared a melt in your mouth puff of foie. The fluff by itself was incredible but it was the accompanying ingredients that tied the ribbon around this gastronomical gift. Up next was my least favorite course of the night. The flounder I was served was slightly overcooked and on the dry side. I suspect that this was the byproduct of attempting to plate 30 dishes of fish at the same time. Overall, this had the potential to be one of my favorites of the night because I really enjoyed the flavorful combination of the secondary ingredients which included Maine lobster, asparagus and vanilla turnip puree. But the flounder just missed the mark for me. When I sat down and saw the menu, I was eagerly anticipating dish number four. This dish featured a fresh and perfectly cooked scallop paired with farro, small pieces of chorizo and crab meat along with some English peas. I enjoyed each element of this dish and they rested on top of a broth that was bowl licking good. The final course before dessert featured a sous vide cooked duck breast paired with confited pork belly, a carrot curry and pistachios. This is another dish that flirted with excellence but fell just short. My only knock was the texture of the duck breast. It was juicy and flavorful but on the chewy side for me. Although, I'm sure sous vide cooking fans probably enjoyed it more than me. Nevertheless, this was another flavorful dish that worked well as a whole. Chef Reidt's dessert was a modern spin of some classic sweet hits, cherries and chocolate. His plate featured dark chocolate truffles, dehydrated mousse, yogurt and cherry sorbet. This dessert was in sync with the meal as a whole from a flavor, texture and color standpoint. Plus it tasted great! I hate to sound redundant but Chef Reidt is clearly talented when it comes to stimulating the senses and obviously has a great palate. Nothing I had was under or over seasoned and every dish contained multiple layers of flavors combined with pleasing textures and colors. I'm not sure how a great restaurant with a talented chef, located in a popular national hotel chain in a major city can be deemed a hidden gem, but that's exactly what Area 31 is. Don't neglect this restaurant or this chef, you'll be missing out. Chef Reidt is flavor flav BUT he is no Public Enemy!!! ** I just realized that I inadvertently neglected to discuss the wine pairings. Master sommelier Emily Wines, yes that is her real name, is responsible for the wine lists at all Kimpton related restaurants including Area 31. I do not know if she had any input on our pairings but whoever did selected some nice wines that complimented each dish nicely. We were also served a "Cobaya Cocktail" that paired well with the foie fluff. Sra. Michybaya - The Cobaya Killer!! !